censorship of the internet. This side-by-side viewer is intended to illustrate the implications of this censorship by providing side-by-side comparisons for search terms. 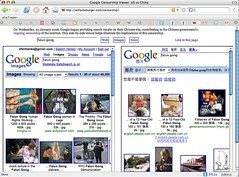 It seems that, even for terms like “democracy” and “freedom“, Google.CN still returns a reasonably good spread of links. Whether or not these pages can be accessed from within China itself is a far different issue, of course. Please leave a comment if you find any search terms with frighteningly different results between the two versions; I’d be interested what other people can find. The OpenSearch API provides a flexible common standard for XML-powered searches. WordPress OpenSearch 1.0 worked on WordPress 1.5, but a few changes in the way WordPress deals with DB configuration and HTTP GET parameters caused it to fail in WordPress 2.0. Thanks to tips from James E. Robinson, III, version 1.1 of this plugin now wraps WordPress 2.0‘s search functionality. This code should be generic enough to allow anyone to quickly add OpenSearch RSS feed functionality to a WordPress 2.0 site. The source of version 1.1 is freely available for download here. Although this isn’t a huge upgrade, there were enough files created or renamed in the background that I felt this warranted a new major version number. There shouldn’t be any visible functionality changes here. Upgraded map code to work within WordPress 2.0. See notes here. As a developer, I constantly find myself reading code, sometimes with its developer at my side to clear up ambiguities, but obviously, far more frequently, the author is nowhere in the vicinity. Maybe I’m trying to sort out a bug, maybe I’m trying to figure out functionality, or maybe I’m trying to optimize performance. My first priority is to understand as much as possible about the code while wasting as little as possible time and effort. What simple steps can developers take to help out the next reader down the line?